A farewell party was organised today at Umang for class XII who will take their National Institute of Open schooling (NIOS) exam starting from next week. It was an emotional tear-filled goodbye to 9 students who are passing out form school this year. The farewell was attended by the parents of passing out class and The Regional Director of NIOS Mr K.L. Gupta. On this occasion students of passing out class remembered their moments of friends, friendship, fun and success at school which they considered as ‘their second home’. According to Karan Sehgal, Umang is his second home which has given him confidence and made him independent, other two students Jayati Lamba and Aliza Hasan said that the support and encouragement of their teacher has made all the difference in their lives and made them what they are today, thanking their teachers. The regional director Mr. K.L. 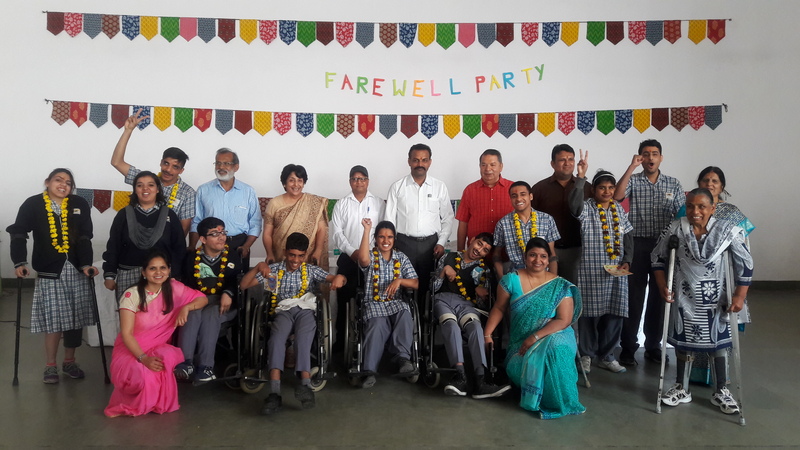 Gupta who was the Chief Guest on the occasion said his interaction with the students was an eye-opener about the potential of children with disabilities. Parents of the students were also very emotional at the occasion. Mr. Hasan father of Aliza Hasan said that the school has given new confidence to his daughter; he was very happy and amazed to see his daughter give a thank you speech. Another parent said that their children have never missed any day at school. The director Mrs Deepak Kalra said that the students have done so well in all areas for which she was very proud of. Their teachers and volunteers were also honoured on the occasion. In the end the baton was passed on by the passing out class to the students who will take board exams next year.